The primary meat of Mediterranean diets, lamb is leaner and more heart-friendly than beef. 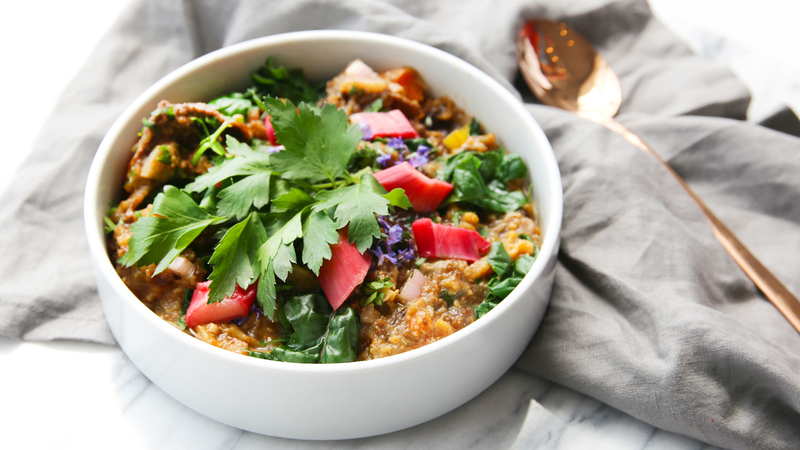 This dish beautifully combines lamb with vibrant rhubarb and Swiss chard to enhance the Vitamin C, antioxidants, and overall cardiovascular support in your meal. If you are used to eating rhubarb in desserts, you may be surprised to know that it is technically a vegetable, and it is in the same family as buckwheat. This dish tastes even better the next day – perfect for leftovers. Recipe courtesy of Lauren Chandler, barre3’s culinary wellness expert. In a heavy bottom Dutch oven or pot, melt 1 tablespoon of the oil over medium heat. In 2 batches, being sure not to crowd the pan, brown the lamb evenly on all sides, salting as you go. Each batch should take 8-10 minutes. With a slotted spoon or tongs, transfer lamb to a plate. Discard oil and carefully wipe out the pan with a paper towel. Melt the remaining oil over medium heat then add the leek, garlic and rosemary and cook, stirring constantly for 2-3 minutes until the light green leeks turn brighter green and soften. Add the carrots and cauliflower and cook for about 4-5 more minutes, stirring occasionally. Remove the lid. Using a wooden spoon, mash the prunes against the side of the pot to break them up a bit, if they haven’t broken down already. Stir in the chard stems and turn the heat up to medium. Boil for 5-10 minutes, so the liquid reduces a bit, then stir in the rhubarb. Cook for 5 more minutes, stirring occasionally, until the rhubarb is tender and cooked through. Turn off the heat, stir in the chard leaves and vinegar, and season with salt and pepper. Garnish with parsley. Keeps well in the refrigerator in an airtight container for up to 3-4 days and in the freezer for up to 4 months.